THIS PRIVACY STATEMENT FORMS PART OF THE TSEBO WEBSITE TERMS AND CONDITIONS. IF YOU DO NOT AGREE WITH ANY TERM OF THIS PRIVACY STATEMENT, YOU MUST CEASE YOUR ACCESS OF THIS WEBSITE IMMEDIATELY. 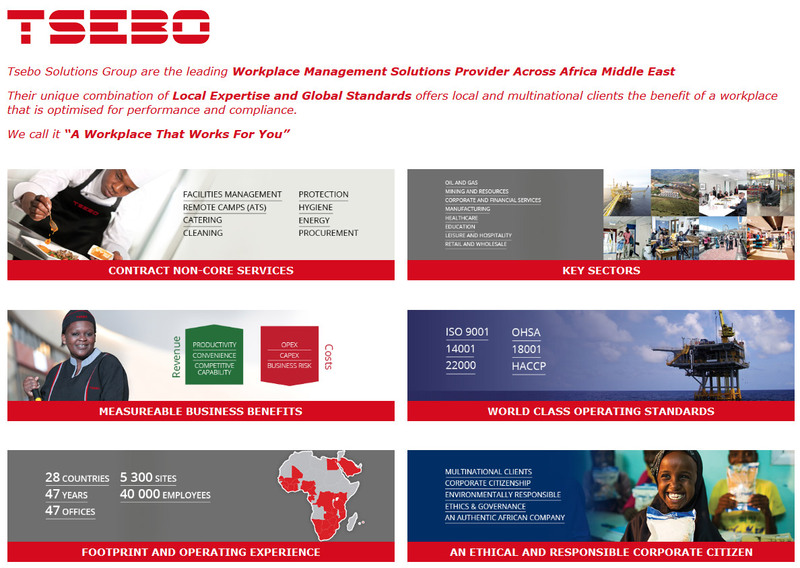 Tsebo Solutions Group and its group companies and subsidiaries (“Tsebo”) are committed to protecting the privacy of the personal information which it collects in the course of business. Tsebo will only collect, use or disclose your personal information where it is fair and lawful to do so. In most cases, we will ask for your consent explicitly but, in some cases, we may infer consent from your actions and behaviour. In this Privacy Statement, your “personal information” means personal information as defined in the Protection of Personal Information Act, 2013 of South Africa.We collect personal information directly from you, and where lawful and reasonable, we may collect personal information about you from third parties and publicly available sources. We use your personal information for a purpose consistent with the purpose for which it was collected and in a manner that is adequate, relevant and not excessive in the way which it is processed.Personal information will only be processed for a purpose compatible with that for which it was collected, unless you have agreed to an alternative purpose or Tsebo is permitted in terms of national legislation of general application dealing primarily with the protection of personal information. You agree that we may disclose your information. As a global business, we may share your personal information within the group and trusted third parties based outside the country in which you live so that they may process that data on our behalf.We may also share your personal information with companies, organisations or individuals outside of Tsebo if we believe that disclosure of the information is necessary for legal reasons. Tsebo has no control over and accepts no responsibility for the privacy practices of any third party websites to which hyperlinks may have been provided and Tsebo strongly recommends that you review the privacy statement of any website you visit before using it further. We may transfer your personal information to servers located outside the country in which you live or other trusted third parties based in other countries so that they may process personal information on our behalf. By providing Tsebo with personal information, you agree to us doing so in accordance with the terms of this Privacy Statement and applicable data protection laws and regulations.You should be aware that many countries do not afford the same legal protection to personal information as you might enjoy in your country of origin. While your personal information is in another country, it may be accessed by the courts, law enforcement and national security authorities in that country in accordance with its laws.